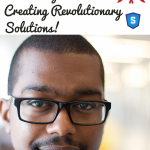 TSE 066: 3 Reasons Why New Sellers Speak So FAST! 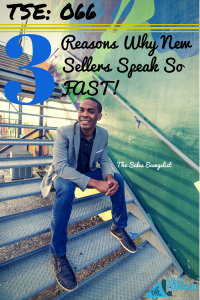 Home » TSE Podcast Post Page » TSE 066: 3 Reasons Why New Sellers Speak So FAST! Have you ever found yourself getting nervous while presenting or even speaking with a prospect? So for your nervousness, do you begin to speak REALLY FAST? Well, you are not the only one. What if I told you it’s something many sellers were (are) guilty of at one time or another? As a new seller I definitely was guilty of speaking very rapidly and lose the people I was speaking to along the way. I may have spent a long time trying to get the appointment and then I would jeopardize the meeting because I was speaking too fast. I wasn’t confident in what I was saying. It was a frustrating because I could not get past the introductory level to help prospects see the value I presented. 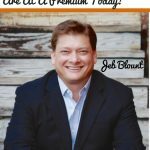 During this episode I share my experience and why new sellers tend to fall to the idea of speaking fast. This tends to happen when you are new to a sales position/company and thrown out on the front line without training. You are given a brochure and a website and are expected to find new business. When you get someone on the phone or standing in front of them, you don’t know what to say and start speaking really fast hoping to recall everything you read. Or you speak rapidly hoping that if you share everything you know, something will jump out and they will want to learn more. Another time when I found myself speaking really fast, was when I spoke with people who were in the executive suite, i.e. Chief Executive Office (CEO), Chief Financial Officer (CFO), Chief Information Office (CIO) or Chief Marketing Officer (CMO). Since I never had any experience talking to these “important people” before, I revert to what I knew. I used to think back to TV shows when the boss would give a sales person 5 minutes to persuade them to buy their product or service. The seller would then rush through his or her message talking about their product or service and then persuade the big wing to buy. This inadvertently caused me to become nervous, speak faster and quickly make a fool of myself. A lot of this came from my insecurities that C-Levels were way too busy to listen to what I had to say. As a result of that I tried to get through my message as quickly as possible. Another area where I frequently found myself getting nervous and speaking fast, was when I encountered objections or something I did not know the answer to. Since I didn’t want to look like I didn’t know what I was talking about, I would quickly ramble on, stuttering over myself trying to piece an answer together so that I could impress my prospect. Obviously this never impressed anyone, but it sure made me look stupid in the long run. So, what did I do to help with this situation? I first had to recognize that speaking fast was not helping. Maybe for some people it was their gift, but for me a as new seller I needed to slow down. I studied and learned about out product or services. I would go on ride alongs with season veterans and learned from them what they were saying, doing and handling themselves in a variety of situations. After learning my product, I would then practice giving that presentation to an imaginary prospect. Speaking to myself in the car, in the mirror or even recording myself and listening to it over again. You can always invite a family member to join us and then video record your message. Both of you can go back through it and evaluate it. Taking 4 deep breathes before a call or meeting helped out a lot as well. With this renew confidence I saw that as I spoke to prospects, they began to have more confidence in me! I was able to articulate my message properly and their confidence grew. This helped when speaking with C-levels. I was better prepared for meetings and had meaningful questions to ask them. This resulted in a thought provoking discussion where they were engaged and spoke more than I did. I also had to tell myself that they were human just like I am and had challenges like anyone else. As far as objections went, since I was prepared, I did not fear. I would answer questions as needed and sometimes turned the questions around on them to get more information. If I really didn’t know I learned this cool technique called “tell them that don’t know”. When I did tell them that I didn’t know, but that I would get an answer for them it wasn’t a big deal. Deals began to progress and my close rate increased drastically! Selling is not a race! Your job is to make sure that your prospects don’t misunderstand you! It is to help them recognize an extreme amount of value in your product or service that they can’t live without your solution. However, if you are loosing them because of your rapid speaking, they will not see value. When prospects understand your message, they will have confidence in you as a seller. They will then have confidence in your product and more opportunities will progress along your sales funnel. You’ll be one step closer to becoming that top producer. Feel free to leave a comment below or share an experience you may have. TSE 1072: Why Your Perfect Pitch Is Not Working!